Two journalists of local news website Jfranews have been arrested for the publication of an alleged defamatory article accusing finance minister of tax evasion. The portal’s editor-in-chief, Shadi al-Zinati, and editor Omar Sabra al-Mahrama were rounded up Tuesday after an Amman prosecutor ordered their arrest. Finance minister Omar Malhas filed a complaint against the outlet over an article published early this month. The article was rejected as false by the director of the Department of Income and Sales. The duo is charged with violating articles 5, 7, and 38 of the Press and Publication Law, and Article 11 of the Cybercrime Law, regional media freedom groups noted. Wednesday journalists from several media houses held a protest in front of the headquarters of the Jordan Press Association (JPA) in capital Amman to protest their collegues’ arrest. The protesters held a banner featuring a quote by Jordan’s King Abdullah promising that journalists would not be prosecuted for doing their work, Middle East Eye (MEE) reports. They received the support Khaled Qudah, the chair of JPA’s Freedoms Committee who reportedly noted that cybercriminal law stifles freedom of the press in the Middle East country. “JPA is working diligently to release Zinaty and Mahrama because of our belief that these arrests strike at the heart of freedom of expression in Jordan,” Qudah was quoted as saying by Jordanian newspaper Alghad. 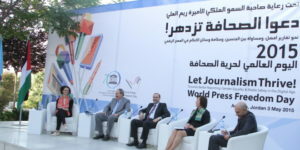 New York-based Committee to Protect Journalists (CPJ) called on the Jordanian authorities to free the two journalists. “Jordanian authorities must not use broad and vaguely defined laws to imprison journalists and stifle media freedom,” said CPJ Middle East and North Africa Program Coordinator Sherif Mansour in New York. Zinati and Mahrama could be fined $7,000 and jailed for up to four months if guilty of online defamation that is punishable under the Cybercrime Law. Written by: KanelkaTagba on January 18, 2018. Posted by KanelkaTagba on Jan 18 2018. Filed under Headlines, World News. You can follow any responses to this entry through the RSS 2.0. Both comments and pings are currently closed.